A decade or two ago, if I were to tell you that M. Night Shyamalan was making an epic sci-fi film, I’m sure you would have foamed at the mouth and would have been first in line to purchase tickets. I put myself in the category. With films like ‘The Sixth Sense‘, ‘Unbreakable‘, and ‘Signs‘, Shyamalan was one of the best directors and storytellers of that time. Then it seemed like Shyamalan died and the soul and mind of Ed Wood took over and made the films ‘The Lady in the Water‘, ‘The Last Airbender‘, and ‘The Happening‘. It’s as if Shyamalan wanted to be the worst director in town and within a few years, held that title. There was a time where film studios would market a movie with Shyamalan’s name only, but nowadays, that doesn’t seem to be the case. For example, Shyamalan did indeed write and direct ‘After Earth‘, but you wouldn’t know that until the end credits. That being said, this is a giant step in the right direction for M. Night. It’s as if he has been barred from the deep end of the swimming pool and was forced to only stay on the kid’s side. But after a few years of punishment, he was invited back to the deep end, but is very cautious not to make a mistake. That’s what this movie feels like. There was some great moments, but as to not upset anyone, there are tons of Hollywood cliches and everything is predictable, which is not Shyamalan’s former style. 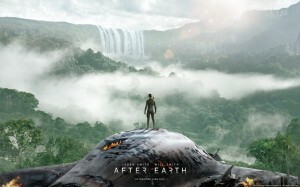 Perhaps Smith had a heavy hand in this creatively, but ‘After Earth‘ doesn’t quite get over that mountain into a fresh and great film. 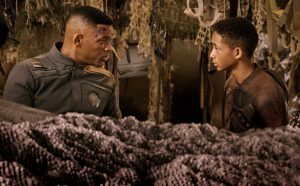 Through its 100 minute run-time, we focus mostly on two characters, Cypher Raige (Will Smith) and his son Kitai Raige (Jaden Smith). Taking place over 1000 years into the future, the people of Earth have left their planet due to some devestating events and have re-settled on a new planet outside our solar system. On this new planet, the humans have built large structures to house themselves as well as some very neat technology in the form of computers, spaceships, and weapons. However, on this new planet, there is an alien species that resembles the alien bugs from ‘Starship Troopers‘. These aliens track their prey by sensing fear, and since humans display fear a lot, we are easy targets. Cypher is the leading commander in a peacekeeping military unit to discover new territories and destroy these aliens as he shows no fear, thus able to move closely between the aliens during battle. Cypher also tends to not show any other emotion as he has strictly adhered to a military officer’s persona. Then we have his teenage son Kitai, who wants to be just like his hero dad, but is rebellious and can’t seem to pass a certain test in military training. In order to bond with his son, Cypher tells Kitai to suit up as they are going on a mission to another planet. Their spaceship runs into a debilitating asteroid field and badly damages the ship, causing them to land the aircraft on the nearest planet, which just happens to be Earth. With the ship split in half, Cypher took a bad injury to his leg and is losing a lot of blood. Meanwhile, Kitai was buckled in a seat and is virtually unharmed. His dad informs him that their distress beacon is broken and supplies are running low, but that in the tail section of the ship is another distress beacon and more supplies. That part of the ship is a several day hike in the wild and dangerous new Earth. 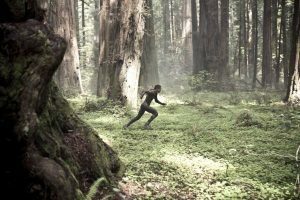 In order to save his Dad and his own life, Kitai must face his past demons and trek through some very menacing situations to stay alive. There were supposed to be some really genuine moments in this film, possibly conjuring up a tear or two. But the cheesy way it’s done and the lack of time the characters are given to develop, these moments are lost and are only greeted with a hint of emotion from the audience. It’s very unfortunate, because it could have really been better. The visual effects of the evolved Earth animals were stunning and looked real, however the big alien bug looked like it was from a lazy design, possibly from a reject of a previous film. Shyamalan himself did a good job here with directing. His visuals are beautiful and very haunting at times. I only wish he stayed true to himself and didn’t cave in to the cliches of Hollywood. The real star of the show is Jaden. He is amazing in this role and has shown he has grown as an actor. He shows his struggle with his relationship with his dad and his fear of being alone and unable to accomplish a task, but then turns that around and shows his confidence and makes us believe he is truly a super star. Great job by Jaden. Then there is Will, whose character doesn’t show a lot of emotion and is confined to a chair for most of the film. He does a decent job, but I’ve seen better from him. But this is truly Jaden’s moment to shine, and he does with style. You will notice that the characters in this movie have a strange accent throughout. I’m not sure why this is, but it’s a different dialect and can be somewhat distracting from the film. It’s like a cross between Jar Jar Binks and the dialect from the future portion of ‘Cloud Atlas‘. It was just unnecessary. ‘After Earth‘ should make a decent opening weekend box office total, but I doubt people will be wanting to see this again. This isn’t the triumphant return for director M. Night Shyamalan, but it’s a good step for him to get back on top. Despite its many flaws, this deserves a look. This entry was posted on Thursday, May 30th, 2013 at 1:28 pm	and is filed under Film, News. You can follow any responses to this entry through the RSS 2.0 feed. You can skip to the end and leave a response. Pinging is currently not allowed. My girlfriend saw it last night & her verdict was i didn’t miss much. (i passed on it & she took her sister) She observed audience reaction & it wasn’t positive. I wasn’t going to go see it anyway so I’ll wait for Netflix. It’s a step in the right direction, but yeah, you don’t need to waste money on it. « Film Review: ‘Now You See Me’! !